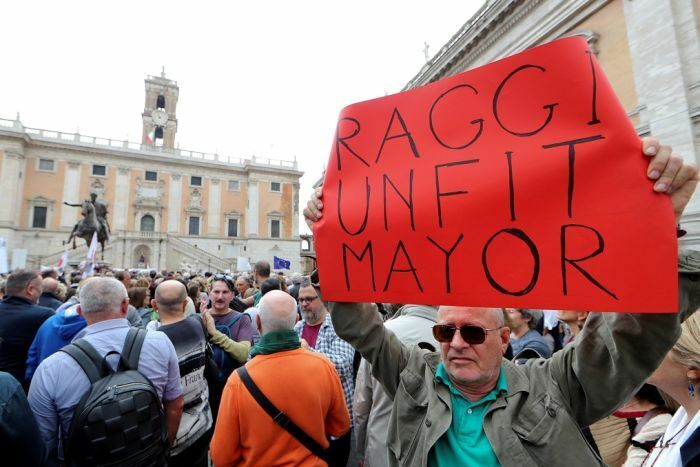 Outraged residents decrying the degradation of their once great city to “an open sewer” have filled the piazza outside of Rome City Hall to denounce the ragged state of the Italian capital. 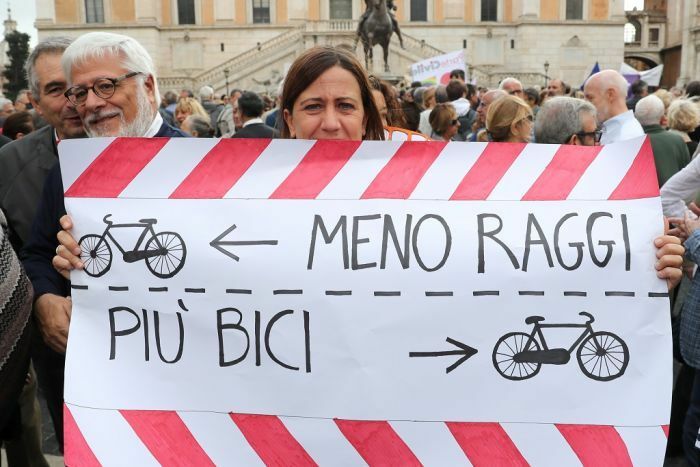 Critics say the city has been in decline for years and accuse Mayor Virginia Raggi, who took office in 2016, of failing to fulfil campaign promises to clean up the mess. 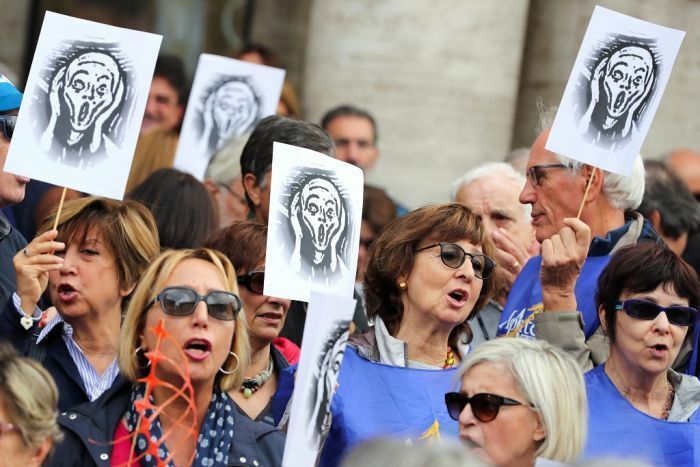 “We’re here because Rome deserves better, because Rome is in a state of neglect the like of which has never been seen before,” said Marita Monaco, 57, who took part in the protest in a Renaissance square designed by Michelangelo. Ms Raggi is a member of the anti-establishment 5-Star Movement and was swept to power following a wave of public disgust over corruption scandals that had battered previous administrations run by both traditional left- and right-wing parties. The first female mayor in the history of the city, Ms Raggi said she needed more time to overcome Rome’s problems, but has argued she is already making good progress. Her critics say things are getting worse, not better. What’s wrong in the once great city of Rome? Among locals’ complaints are roads riddled by potholes, a strike by rubbish collectors that left many public bins overflowing, and a transport system in permanent crisis. More than 20 buses have caught fire on the streets of the city so far this year, largely the result of poor maintenance, while a broken escalator injured more than 20 Russian soccer fans at a city metro station last Tuesday. The recent death of a 16-year-old girl, whose body was found in an abandoned building used by drug dealers, underscored fears about law and order in the city. Police said they believed the girl was gang-raped and reported the arrests of four migrants. 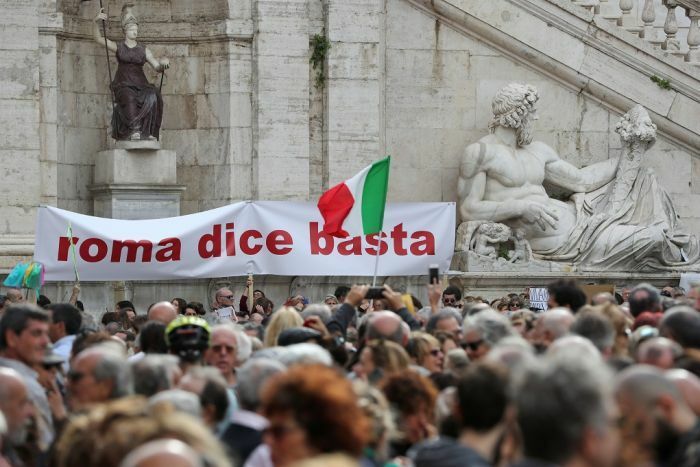 Under the hashtag #romadicebasta (“Rome says enough”), residents’ associations and civil society groups banded together to organise Saturday’s protest, which Reuters reporters estimated drew between 5,000 and 8,000 people. “Rome has become an open sewer, a scandal, full of rats, foxes, wild boar and rubbish,” Rome resident Salvatore Golino said. A recent video that went viral online showed a family of four foraging through sacks of rubbish on a city street. Another video earlier this year showed a large boar running up a major city road under the gaze of astonished drivers. The extent of the rubbish problem was exposed to the world during severe storm across Italy last week with images of garbage bags and debris floating in floodwater. Ms Raggi is standing trial for alleged abuse of office over a contested appointment within her administration. She has denied the accusation, but has said she will resign if found guilty. A verdict is due on November 10. Her administration would fall if she left office, potentially opening the way for fresh elections.